In late summer of 2017, a resident asked the village board of Mundelein, Ill., a northwest suburb of Chicago, to place a Hanukkah menorah in a public park next to the traditional Christmas tree. Village attorney Charles Marino provided this guidance: “My (legal) research has indicated that a Christmas tree or a holiday tree is secular,” he told the Chicago Tribune. “It is not a religious symbol. It is neutral. However, a menorah is a religious symbol and a creche is a religious symbol. …And so, a safe harbor is where the village is right now.” The Mundelein Village Board turned down the request. Was the attorney’s advice correct? More than 30 years ago, the U.S. Supreme Court first wrestled with the constitutional boundaries for religious speech and displays on public property. The issue raises questions about the intersection between First Amendment protections of free speech, the free exercise of religion and the prohibition against a government "establishment" of religion. Although the Supreme Court has set strong guideposts through a series of court decisions, the issue continues to percolate. December heralds religious holidays, including Christmas and Hanukkah, and each year communities like Mundelein struggle with issues stemming from the constitutional tension between holiday expression and religious endorsement. 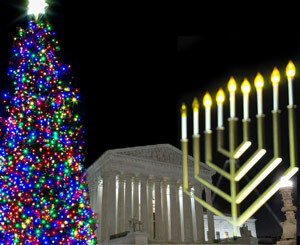 In Mundelein’s case, the advice from village attorney Marino, who has served in that part-time capacity for nearly 45 years, appears soundly based on U.S. Supreme Court precedents and the court’s distinction between secular symbols, such as the Christmas tree, and religious symbols, such as the Christian creche or the Jewish menorah. In 1971, the Supreme Court decided Lemon v. Kurtzman, a ruling that continues to serve as a guide for lower courts on some religious issues. In Lemon, the court decided that a Rhode Island law that paid some of the salary of parochial school teachers was unconstitutional. The majority opinion by Chief Justice Warren Burger articulated what is known as the Lemon Test, setting out when government violates the Establishment Clause of the First Amendment. In short, government action is not permissible unless it has a significant secular or nonreligious purpose, does not have the primary effect of advancing or inhibiting religion and does not foster excessive entanglement between government and religion. Thirteen years later, the Supreme Court began to apply the Lemon Test to religious displays on public property, primarily through two cases. In the first, Lynch v. Donnelly, a 5-4 majority opinion allowed a creche or a Nativity scene in Pawtucket, R.I., in a public display that included other objects, such as a Santa Claus house, a Christmas tree and a banner that read "SEASONS GREETINGS.” Lower courts, including a federal circuit court of appeals, had enjoined the city from including the creche in the display. Five years later in County of Allegheny v. ACLU, the court again addressed the creche issue. The critical 5-4 majority opinion, written by Justice Harry Blackmun (who was in the majority in Lynch), found that an unaccompanied Nativity scene placed on the Grand Staircase inside the Allegheny County Courthouse in Pittsburgh, which is one of the most public parts of the courthouse, violated the Constitution. The creche was donated by the Holy Name Society, a Roman Catholic group, and bore a sign to that effect, and its manger had at its crest an angel bearing a banner proclaiming “Gloria in Excelsis Deo,” meaning “Glory to God in the Highest.” The court split 6-3 in permitting an 18-feet-high menorah to be set up a block away outside next to a Christmas tree on public property.